High potency 1000 mg of pure fish oil. No other company goes to such lengths to make sure their fish oil is that safe. 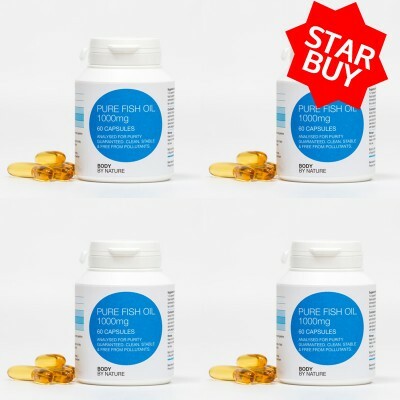 Our company strives to sell you the very best and safest Pure fish oil we can find. The cheapest fish oil can some times contain Heavy metals such as Mercury because these companies fail to test what they are selling the public or may be just don't care. We have also seen fish oil which contains Dolpfin, Shark and other fish on the endangered fish list. Buy the very best oil you can from a UK supplier. Many people in the UK have vigilantly warned against eating fish, as virtually all fish these days contains dangerously high levels of mercury and other toxic contaminants.If it wasn't for the health risks posed by this contamination, fish in general would be among my absolute most recommended foods for their outstanding nutritional benefits. Is effective for all family members. Comes in easy-to-swallow gluten-free capsule form. Our high potency fish oil capsules give you 550mg EPA/DHA (essential fatty acids) per 1000mg capsule. Fish Oil is produced under stringent manufacturing processes. All fish oil products sold by Body by Nature are absolutely clean, stable and have NO trace of any of the ocean pollutants, heavy metals, etc. (Detection is now possible in parts per million) —Per Capsule composition: EPA 330mg, DHA 220mg; Omega 3 Content 550mg; total oil content 1000mg. EPA and DHA are essential for a healthy heart, arteries, brain, eyes and flexible joints. 100% pure, premium quality fish oil vigorously screened for pollutants. Ethically sourced from clean seas. Safe during pregnancy and breast feeding as does not contain Vitamin A. Free from yeast, wheat, gluten, soy, starch, lactose, added colourings, sweeteners and preservatives. Suitable for men, women, children and the elderly. Free from Genetically Modified Substances. Free from live yeast. There are 2 types of fatty acids actually called ‘Essential Fatty Acids’ which our bodies cannot produce naturally. But, it is vital that you need them to live. The only way to get them into your body is by consuming them. Omega 3 and Omega 6 levels has sharply fallen over the years because of our diets which means we are ill-equipped to assimilate an unsuitable fat intake. The answer is to consume more fatty acids and start reaping the health benefits that can give. Or to take a good supplementation with all the benefits that Body by natures fish oil offer. Oily fish is an excellent source of protein, vitamins and minerals that is connected to essential roles in normal brain functions. Our pure fish oil is made from whole oily fish such as; anchovies, herrings and sardines Rich in omega-3 oils, these fish contain calcium, iron and phosphorus. Niacin is also an active ingredient which helps with DNA repair, and selenium, for cell function. Herring Herrings are a great source of protein and vitamin B12, alongside the benefits of selenium and phosphorous, which aid DNA health. Sardines are a great source of calcium when eaten with the bones intact, especially for those who want to avoid a dairy-rich diet. Body By Nature sardines are fished when they are at their prime to provide the best levels of Omega 3. It’s by far the most convenient and easiest way to consume the all important fatty acids that the body requires. By supplying them ready formed, you negate the need for the wasteful process of conversion, and supply the body directly with what it needs. Fish oils from the body of the fish, rather than the liver, bestow all the health benefits of fatty acid nutrition without the worry of accumulated toxins. Fish oil concentrate (from sardine and anchovy), capsule shell (gelatin and glycerine). The oil is cold water low pressure distilled to maintain integrity of fatty acids and to ensure it is clean, stable and free from pollutants. 1–2 capsules daily, or take as directed by a practitioner. Do not exceed the recommended daily intake. This product should not be used as a substitute for a varied diet. People with Candida and yeast sensitivities. People with allergies to fish. Avoid if there is any deficiency of the liver, or if you are on antithrombotic drugs (e.g Warfarin or Heparin), consult your doctor. This product contains fish derivatives and therefore should be taken by people with allergies to fish. Wheat; yeast, starch, gluten; lactose; added sugars, colourings, flavourings & preservatives. Guaranteed clean, stable and free from pollutants. Keep cool, dry and out of direct sunlight. Keep out of reach of children. If seal is broken on purchase do not use.